Preheat the oven to 350F. Line an 8×12″ baking dish with parchment paper. Put the dry ingredient (except for the fruit) onto a sheet pan and bake for 10 minutes. Add the butter, honey, brown sugar, vanilla, and salt to a small saucepan and bring to a boil over medium heat. Cook and stir for a minute, then pour over the toasted oatmeal mixture. Add the fruit and stir until the dry stuff is evenly coated. Pour the mixture into the prepared pan. Wet the back of the spoon you were using to stir and lightly press the mixture evenly into the pan. Bake for 25 to 30 minutes, until light golden brown. Cool for 2 to 3 hours before cutting into desired shape. I choose to do bite sized pieces but you could just as easily do bars or break out some industrial strength cookie cutters and make Christmas trees or something. I looked at a few recipes before settling on this one. This is pretty much a straight rip off of Ina Garten’s recipe. I also tried Alton Browns recipe and from the stark similarity between the two I gleaned that granola bar recipes are pretty flexible, so I experimented a bit. As long as you have the right ratio of dry to wet ingredients, you can throw in anything you like. Some ideas that I tried were, flax seed (they have omega-3, a nice smokey nuttiness, and they add a nice crunch), sunflower seeds, dried apples, dried apricots, dried cherries, dried cranberries, raisins. Some things that I still want to try, macadamia nuts, chocolate, candied orange peel. One last note on why I like this version over Alton Browns, coconut. The shredded coconut adds another level of binding and a unique chewyness that Alton’s were lacking, so unless you hate coconut I’d leave it in there at the recommended ratio. You’re back! I’ve been watching the blog reel for updates, and was excited to see yours highlighted this morning! 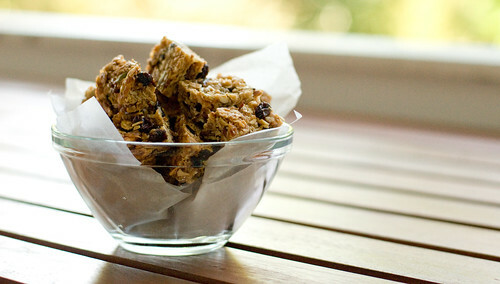 Homemade granola bars are far superior to store-bought. These look great. Wheat germ always enhances the nutty flavor, and of course the nutritional content. awesome! I love the idea of adding candied orange peel. That plus chocolate chips would be yummy. It’s good to be back. I saw your post about how trendy granola bars are. I guess I’m trendy with out even knowing it. I don’t know about olive oil granola though. I think I just love butter too much. These look WAY better than the Nigella Lawson ones I tried to make a few months ago. I eat granola every morning, so a change in shape would be welcome. I used basically the same recipe, but I replaced nuts/seeds with hazelnuts (didn’t remove husk), and I replaced the butter with Nutella. They were delicious. They cut perfectly, and were not hard and crumbly. Huge success. I want to buy everything in the seed/nut/grain isle at Fresh Market and try different granola bars!! I’ve been fortunate enough to sample these and they are definitely quite good. This weekend James made a batch with M&Ms inside for my kids and you can imagine the smiles on their faces.